By Scott Gilfoid: This Friday, Naoya ‘Monster’ Inoue (15-0, 13 KOs) will be looking to crush WBA secondary bantamweight belt holder Jamie McDonnell at the Ota-City General Gymnasium in Tokyo, Japan. Inoue, 25, is moving up in weight from the 115lb weight class to seek his third division title. The 5’5” Inoue will need to overcome the huge 5” inch height advantage of the 5’10” McDonnell for him to have a shot at winning the fight. To get accustomed to McDonnell’s height, Inoue has been sparring with the 5’10” featherweight Raza Hamza (9-0-1, 5 KOs) to get ready for the fight. If Inoue fails to achieve victory on Friday, it won’t be for lack of preparation. 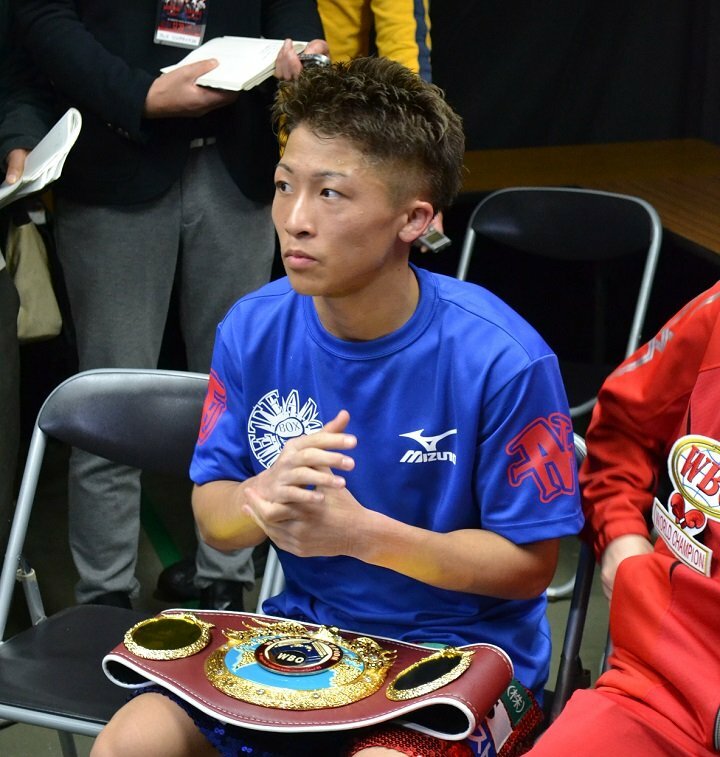 The four-year pro Inoue is using McDonnell as a warm-up to get him ready to compete in the World Boxing Super Series tournament against the likes of Zolani Tete, Ryan Burnett and Emmanuel Rodriguez. McDonnell is not viewed as being on the same level as those fighters despite the fact that he’s still technically a world champion in holding down the WBA ‘regular’ bantamweight title. Inoue won his first world title in just his 6th pro fight in beating Adrian Hernandez. Inoue later won his second title against Omar Narvaez in stopping him in 2 rounds. Oddly enough, Inoue compares McDonnell to the 5’2 ½” Narvaez for some reason. Inoue envisions his fight with McDonnell to be a high intensity fight like his match with Narvaez was four years ago in 2014. Inoue was only 21 at the time he blew away Narvaez in 2 rounds. Now four years later, Inoue will be attempting to do the same thing against the much taller McDonnell. It probably won’t be nearly as easy for Inoue to beat him as it was against the smaller and much older Narvaez. McDonnell feels he can box Inoue and use his size to get the better of the Japanese fighter. The size is going to be a problem for Inoue, because when they were standing next to each, McDonnell looked gigantic compared to him. It’s not just the height of McDonnell. It’s the weight that he has on his side. Inoue is not a true bantamweight, and neither is McDonnell. Inoue is more of a flyweight. With McDonnell, he’s got the size of a super bantamweight or maybe even a featherweight. He’s much bigger than Inoue, and he should have a considerable weight advantage over Inoue on Friday. McDonnell has defended his WBA 118lb title six times since winning the belt in 2014. McDonnell met his match in his last two fights against Liborio Solis, who got the better of him in their first fight in November 2016. McDonnell was given a 12 round unanimous decision over Solis by the judges, but the fight was seen as a hometown decision. McDonnell is from the UK, but his promoter Eddie Hearn was the lead promoter for the fight. The World Boxing Association ordered a rematch, but McDonnell made Solis wait for a year before giving him a rematch last November. The fight was stopped due to McDonnell suffering a cut that caused the bout to be stopped in the 3rd round. The bout was ruled a no decision. Even though the fight was ruled a no decision, McDonnell moved on and signed to fight Inoue. It’s unclear what Solis’ status is. He’s now ranked below #2 WBA Inoue and #1 WBA Reymart Gaballo in the WBA’s rankings. McDonnell, 32, is going to have to figure out how he’s going to keep Inoue from getting inside on him to unload his body shots, because that’s what he’s going to be attempting to do the entire night. Inoue is moving up in weight three pounds in moving to bantamweight, and that’s not a lot of weight. What McDonnell has going for him is he puts on a lot of weight after he rehydrates for his fights. So, Inoue is basically going to be fighting a guy at least two weight classes heavier than him in McDonnell on Friday night, and that could make things a lot tougher. McDonnell has some plan up his sleeves to try and control Inoue’s punching power on Friday. The best way for McDonnell to accomplish that is to stay on the outside, use his jab and not get in any fire fights with the Japanese fighter The worst thing that McDonnell can do is to try and mix it up with Inoue, because all it takes is one hard body shot and that could be the end of story. The days of McDonnell being the best bantamweight in the world are long past. Maybe he could make that argument four years ago when he first became a world champion at 118, but not now. With the emergence of Zolani Tete, Luis Nery, Emmanuel Rodriguez and Inoue, McDonnell is probably no better than the sixth best fighter behind those guys as well Liborio Solis. If McDonnell is going to prove anything on Friday, he needs to prove that he can go the 12 round distance, and not be involved in a controversial ending. I think it would a moral victory for McDonnell if he can go the full 12 rounds on Friday night with Inoue, because a lot of boxing fans don’t expect him to be able to make it that far in the fight before he’s knocked out.